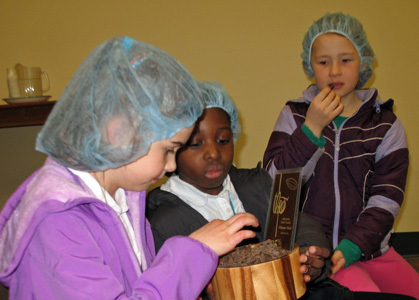 In early March my class went on a field trip to the Theo Chocolate Factory, in the Fremont district in Seattle. Mom took the day off to go with me. We weren't allowed in until we put on hairnets so we wouldn't contaminate the chocolate. First we sat for a lecture about where chocolate beans come from, what happens to the beans in the forest, how the company purchases its beans, and how it makes the chocolate in the factory. We also tasted different percentages of chocolate [left]; my friends and I did not like 70% dark! Next we toured the factory and saw the drums of beans and the huge machines that roast and process them. We also saw some people combining the chocolate with other ingredients like coconut, almond, orange, and mint to make the final bars. Finally, we visited the gift shop, where we tasted pieces of everything from salted caramel to fig and fennel. Mommy purchased three bars to take home. I'll never look at a chocolate bar quite the same again! This year Easter fell on April 8th. I was really excited for the Easter Bunny to arrive. When I woke up Easter morning, I waited patiently for Mommy and Papa to get up. Aren't I good? When they did, I ran downstairs and found a big basket at my place at the kitchen table. (Cameron had one, too, even though he was at his fraternity.) Inside the basket were a chocolate bunny, chocolate cream eggs,, and jelly beans. There were also two small flower pots with seeds, Easter pencils, two special pens, and best of all, Just Dance 3 for our Wii and a journal with a lock and key! (That's what the pens and pencils were for.) I could hardly wait to dig in! Next I searched the house for hidden eggs, each with a piece of chocolate inside. I collected over forty that morning; a couple weeks later I finally found the last one! 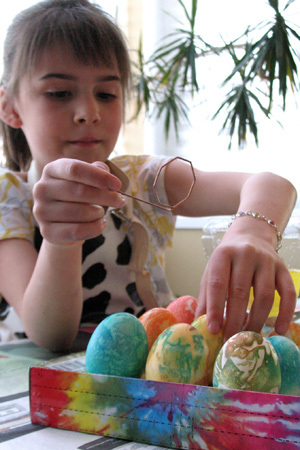 Later in the day, I decorated Easter eggs. Mommy had a tie-dye coloring set, and I made some beautiful marbled eggs using dye, a dropper, and a damp cloth [right]. 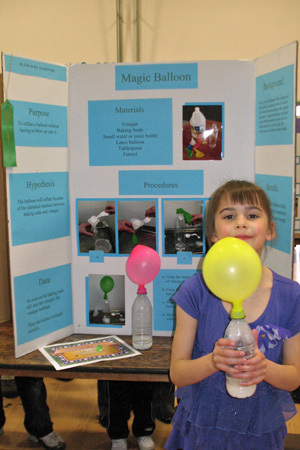 For this year's school science fair, I chose an experiment called the Magic Balloon. Mommy helped me gather all the ingredients: vinegar, baking soda, balloons, pop bottles, a funnel, and a tablespoon. Papa and I tried it first outside to see what would happen (while Mommy took photos for my poster). We put vinegar in the bottle, and we put baking soda into an empty balloon. Then we fit the end of the balloon over the opening of the bottle and poured the baking soda in. As soon as the baking soda hit the liquid, it fizzed almost to the top of the bottle. Then the balloon began to fill up. The reason is that the two ingredients together gave off carbon dioxide. Mommy helped me make a poster (I wrote all the words myself), and I presented it first to my class and later that evening to lots of other classmates and parents [left]. For my effort I got a certificate and a ribbon. It was a fun experiment. I wonder what I'm going to do next year? This year the University of Washington is 150 years old. That's where Cameron goes to school. It's also where Mommy works, and where she went to college, too. So on April 21st we drove to campus after Oranjeschool to join a public celebration. There were lots of booths with food, music, and fun things to do. Lots of people were wearing purple. We ate hotdogs in the sun and walked around the campus [right]. I liked the engineering tents, especially the one that demonstrated solar energy by letting kids connect little solar panels to model cars. I also liked Drumheller Fountain; I used a stick to fish out leaves and garbage. 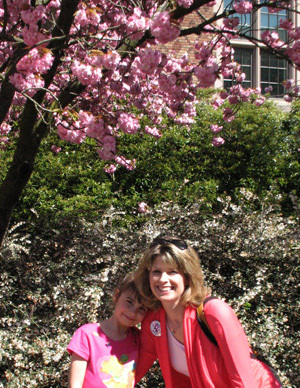 We didn't see Cameron because he was home sick with an ear infection, but I think he's lucky to go to school at the UW. Koninginnedag is Queen's Day in Holland. 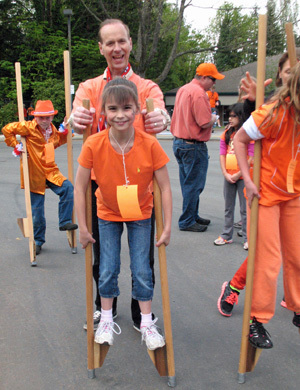 This year the Oranjeschool had a big celebration. We got a passport for all the games, and then I walked on stilts [left], played schulen, pinned the tail on the cow, threw balls through a target, ran a obstacle course with an egg on a spoon, and, most disturbingly, tied a string with a long nail at the end around my waist and squatted to get it into an upright milk bottle without using my hands. With every game I played, I earned tickets, and when I was finally finished, and had more than 40! I got to turn them in for lots of prizes. There was also a puppet show and an auction. Mommy got a 5-minute back massage. I helped Papa hand out tickets when he was in charge of he schulen table. And we ate kroket, krentebollen with raisins, and sauzijzenbroodje. Finally, during the last hour, Papa and I played in the kids versus parents soccer game. I didn't make any goals, but I think the kids won. Kids rock! On May 8th, my class performed its version of Flat Stanley, based on the book by Jeff Brown, for parents at the Northshore Senior Center. In our 20-minute production, Stanley accidently gets squashed flat as a pancake by his brother, Arthur, and after the doctor tells him that nothing can be done, he is mailed around the world to experience many adventures. In our play, he also helps catch some art thieves. 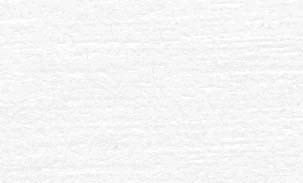 My parts were one of three narrators, and a nurse who helps examine Stanley when he visits the doctor. We sang two songs: "You've Got a Friend in Me" (from Toy Story) and "Let's Go Fly a Kite" [right] (from Mary Poppins), because Arthur flies Stanley, although he gets caught in a tree. 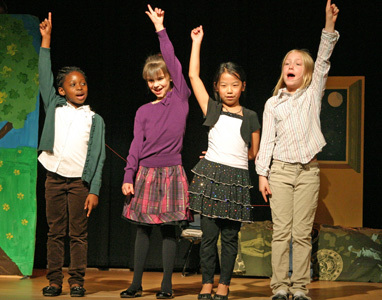 We practiced with our drama and music teachers for many weeks before our presentation, and I learned all my lines by heart. I loved hearing all the applause at the end!